Gallery #13 - Let's Play Two (Hundred)! Gallery #26 - All Rise! About "Seminole Smoke: An odyssey..."
About "Currents of Power: A Modern Political Novel"
Get Your Head Outta Your Apps! I once spent a day tooling around in a '64 Dodge Polara with U.S. Senator Chuck Percy, who died recently. It was 1966, I was a teenaged political junkie, and my dad and Percy were campaigning together. Percy - fresh off an unsuccessful gubernatorial bid - was running hard for U.S. Senate. My dad - Claude, Jr. - was running hard for Illinois State Rep. My grandfather - Claude, Sr. - was a veteran Illinois legislator who had lost his seat in the infamous at-large "bed-sheet ballot", and was itchin' for a fight. Pop and Daddy were both "newspaperman", free-market, free-speech guys and proud moderate Republicans, so an alliance with Percy was natural. Pop arranged to drive Percy, my dad (and little Claudie) around northeast DuPage County to a series of campaign meet-and-greets, a rally and two fundraisers. We piled into our shiny black '64 Dodge Polara, an 8-cylinder tribute to and reflection of the Space Race (featuring "jet pod" taillights). Percy sat in the front passenger seat, while Daddy drove the rocket-car. In the back-seat, Pop - a one-time semipro football player turned publisher - talked non-stop as Mom and I sat in awe. In those care-free seatbelt-less days, Percy twisted around so he could listen to Pop. The beautifully-tan Percy chuckled, nodded, and, when he could get a word in, included Mom and me in the conversation. So smooth, I remember, so eloquent. As Percy met folks outside the National Tea, even a 13-year old could recognize a gifted pol . During his speech at an Addison GOP rally, he lauded me on my leading of the Pledge of Allegiance. Back at our small ranch house for a reception, Percy wowed our Bensenville neighbors, met privately in our laundry room with Congressman John Erlenborn, and gave my sister Lisa - an aspiring journalist - her first interview. We piled back into the jet-pod Polara and flew to the River Forest Country Club for a gala dinner, where Percy gave another stemwinder. It was my first campaign fundraising dinner...I still have the program book stashed in the basement. While the Walkers were suburban Republicans, my mom's side of the family was working-class Chicago Democrat. Liberal-minded Uncle Rick wouldn't jump on Percy's bandwagon because Percy was making age an issue against revered incumbent Sen. Paul Douglas. That didn't matter to Pop and Daddy, who campaigned hard for Percy. 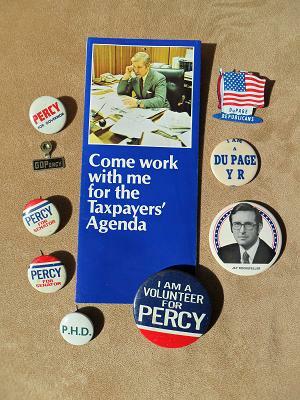 My dad lost his State Rep race (to Pate Philip, who went on to be Illinois Senate President), but Percy beat Douglas and served three terms in the U.S. Senate, including a stint as Foreign Relations Committee Chair. Later, as a field organizer for the '84 Paul Simon campaign against Percy, I was quick to rebuff fellow Simonites who would use age as an issue. I always thought back to that day on the campaign trail with Percy and Pop. Long after my dad and grandfather were gone, every time someone got into the jet-pod Polara, Mom would note that Senator Percy sat right there.